When they were little boys, aged 6 and 8, their Nanna was babysitting them while I worked late. She’d made them a nice dinner and cleaned up my kitchen. The best babysitter! Unfortunately, she got a bit of food stuck in her false teeth and couldn’t get it out. It was aggravating her so she asked the boys if they had a spare toothbrush anywhere. “No Nanny” said grandson. She explained she needed something “like a toothbrush” and 8yo remembered the nail-brush, which was good at cleaning things, so they ran to fetch it for her. The little inquisitive boys followed their Nanna into the laundry. She popped her false teeth out into her hand and started scrubbing them vigorously under running water with the nail brush. The boys started giggling their little heads off. Nanny loved the laughter and presumed they’d never seen false teeth before. She was so wrong! They started laughing, louder this time, cupping their hands over each-others ears and whispering, as little children often do. Oh, the little angels could hardly contain themselves. “Well, out with it!” demanded Nanny. Through fits of laughter, 6yo said “Nanny, you are so funny?” “Why? Surely it wasn’t that funny, was it?” she asked. The little horrors broke down into hysterics again. 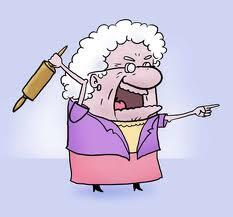 Nanny rushed back to the basin and washed her false teeth with soap and water, muttering under her breath! Prologue: Nothing much has changed with those two sons of mine over the years. They have been completely exasperating at times with their antics. Those same little boys are now 20 and 22 years old. Their favourite victim now is their Dad; with Nanny coming in a close second!